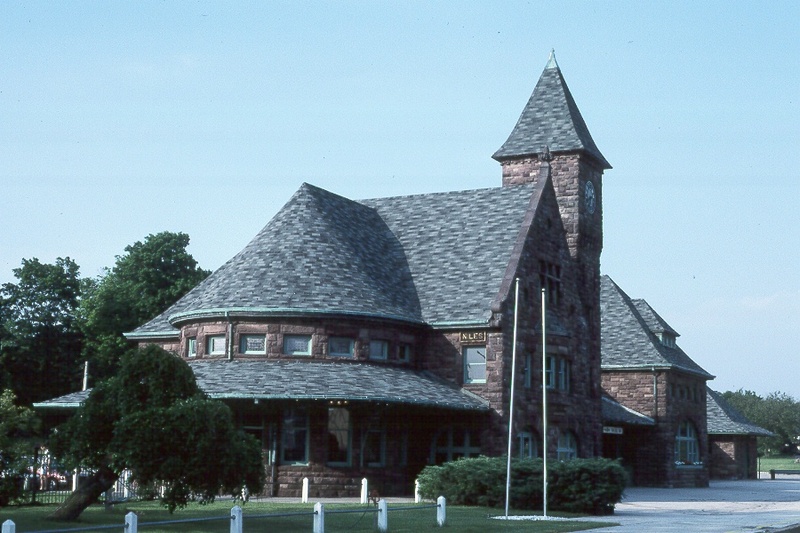 Opened with the intent to impress travelers on their way to Chicago in 1893 for the World�s Columbian Exposition, the station at Niles continues to serve and impress today. Niles is a major stop on the former Michigan Central Railroad, which was one of the several components of the late, great New York Central. Architects Spier and Rohns designed the large stone structure centering it on a tall clock tower nearly 68 feet high, capped with a steep, pyramid shaped roof. The clock itself was an impressive piece of machinery, manufactured by the Boston firm of E. Howard Watch & Clock. The clock faces are five foot in diameter, and at night can be seen from a far distance. Designed in a Romanesque style of architecture out of Ohio brown stone, the depot has withstood the ravages of one hundred years of use. The interior was lavishly furnished using oak wainscoting and ceilings. Other details included stained glass windows, and liberal use of brass and terra-cotta fixtures . The station occupies a prominent location in town, and at one time was renowned for beautifully maintained gardens. The station name would be spelled out in flowers. Greenhouses were located nearby that the railroad used to furnish flowers for dining cars and the fine depot restaurant. The greenhouses were removed in 1935. A separate express building also handled the baggage department, and was joined to the station by a covered walkway. The main building housed a restaurant, and an apartment above was provided for the restaurant manager. 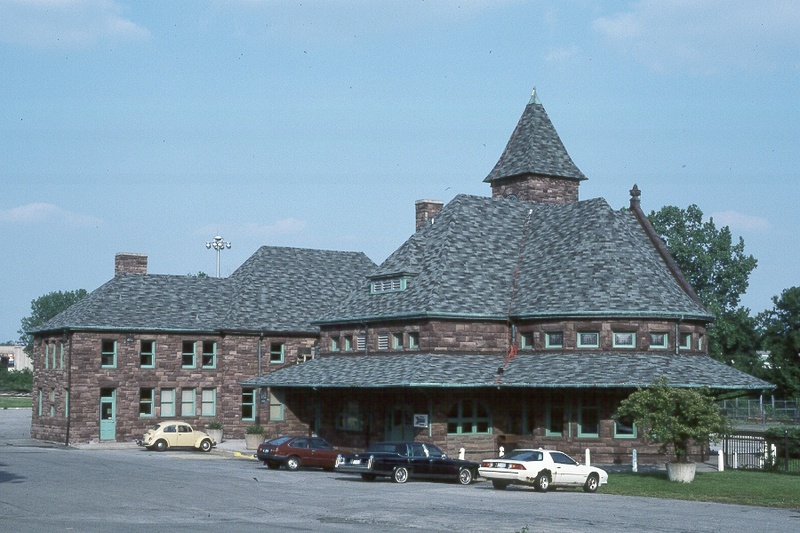 At one time, prior to the current station, Niles was classified as an "eating station" before dining cars became the norm. 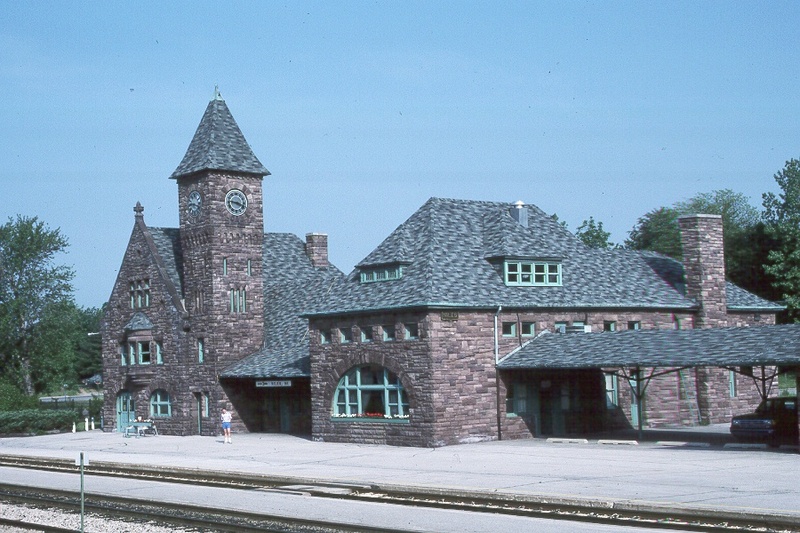 It�s 9:16 am on warm spring morning, May 21 1991 at the restored Niles, Michigan station. The lower morning sun brings out the wonderful patterns and colors of the Ohio brownstone. Busy today with Amtrak�s revived Michigan services, the Niles station underwent a restoration of the venerable but deteriorating structure. Thanks to those efforts, the building has retained much of its historic beauty, and hopefully will serve rail passengers for the next one hundred years! Trackside view looking east, May 20, 1991. Although the lavish gardens have long since been removed, the station landscaping is still impressive and well maintained. The Michigan Central RR certainly knew how to impress its patrons with great architecture and settings! Several other examples of classic railroad era structures still survive in active passenger use on the former Michigan Central mainline. Notice the signature gold and black New York Central heritage station sign at right center above the second story window. Streetside view, May 21, 1991.